Last winter I had my first chance to interview Montreal Canadiens enforcer Brandon Prust when publicists from the W Network pitched a preview story for me to do on their reality series called Hockey Wives. Prust and his beautiful Quebec TV star girlfriend Maripier Morin were part of the cast. Brandon Prust and Maripier Morin. The call began with Maripier on the line. A model and TV show host, she was full of energy and personality as she spoke about their loving and committed relationship, how they met and of course the show. When our chat concluded I asked if Brandon was there. Seconds later he came to the phone, happy to talk and clearly thrilled be living in Montreal. When the show aired, Maripier was shown with a deep look of concern on her face and wondering what would happen if Brandon was traded. Her career is not transportable as far as French language TV is concerned. Well only a few weeks after the W Network announced the return of Hockey Wives for another season, and Maripier and Brandon back in the cast, their worst nightmare was realized. Habs GM Marc Bergevin, the same man who signed Brandon to a four year, $10 million contract as one of his first actions on the job in the summer of 2012, traded him to the Vancouver Canucks for Zack Kassian. Talk about a horrible engagement gift! Brandon had just placed a ring on Maripier's finger two weeks ago. I can only say that I am flabbergasted by the move. Here is a modern-day Chris Nilan who will drop the gloves and defend any of his teammates. He can score goals, kill penalties and acts as a team leader. Kassian will likely be another Rene Bourque, placed on waivers before we can blink while Prust adds more grit to the Canucks. Who do the Habs have now to act as a police man? Defenceman Jarred Tinordi is the only one who comes to mind, but he is the Rodney Dangerfield of the Habs and gets no respect - consistently shuttled back and forth to the minors. Perhaps 2014 top draft pick Michael McCarron can do the job, but it is probably too early for him. It won't be Brian Flynn, who signing puts me to sleep nor local boy Torrey Mitchell or Devante Smith-Pelley, who uses the body, but does not fight. If the team does not find a successor to Prust in this department just watch how many teams go after their star players. Prust dishes out a pounding. 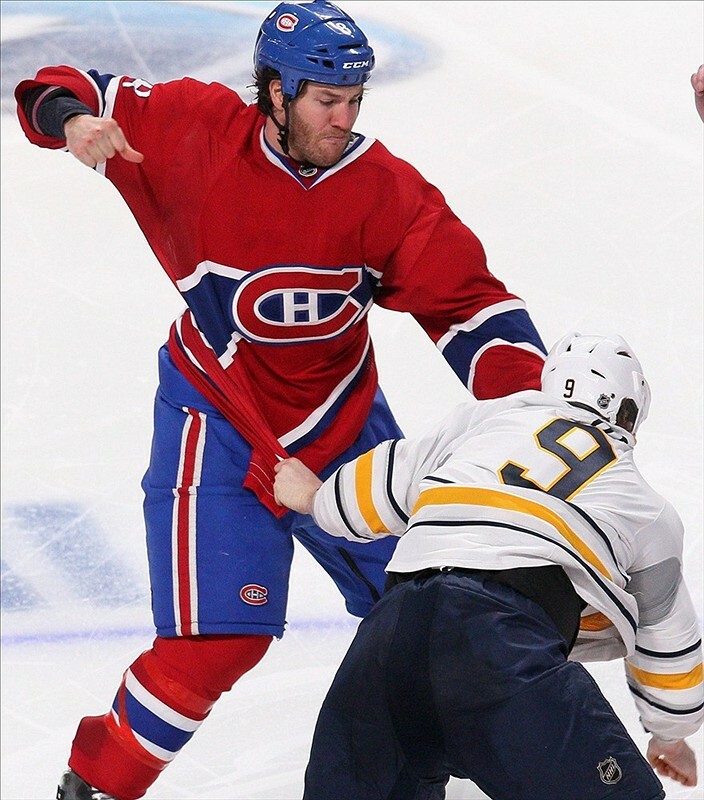 Prust knows exactly how to fight. I love the way he'd tap an opponent on the shoulder and whisper "good one" showing what a real sport he is. He becomes a free-agent again at the end of next season. Now 31, he probably has several good years left. Post-career and during off-season expect to see him return as a Montrealer. 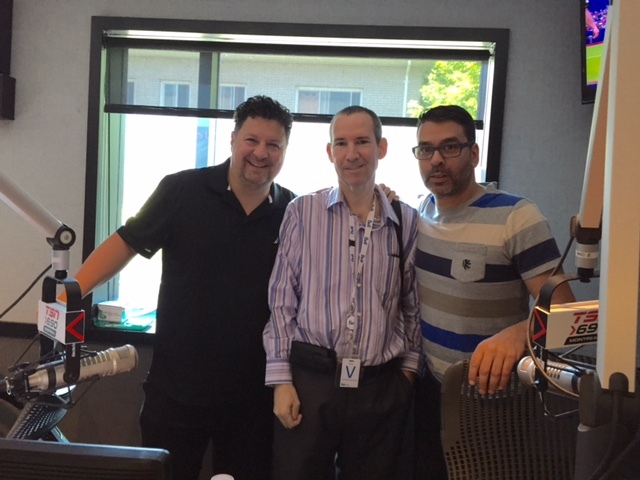 TSN 690 should reserve a spot for him as co-host of Off the Cuff with Nilan. This was not only a good hockey man, but someone who wore this city on his sleeve. He made community appearance and in fact had agree to visit some of our public schools when we spoke. So much for that I guess. Our loss is Vancouver's gain. Since this is Canada, there is indeed a French speaking community there and francophone media. Would Maripier make the jump to B.C.? Morin is a former figure skater who gas graced the small screen since 2007 on a number of different shows for TVA and V. She was a face for Revlon in Quebec, a partner with Prust in the Montreal restaurant Laurea in Mile-End a partner in the Canadian cocktail line UNIK. She actually became close friends with Tiffany Parros during enforcer George’s brief one season stay here. Tiffany, the mom of twins, runs her own fashion line, with celebrity clientele including Mariah Carey, Lindsay Lohan, Amy Smart and DeWulf.